I strongly suggest using sand ceremony vows if your wedding is going to be outdoors. Especially if you're getting married in the North Georgia mountains, there are beautiful breezes that blow most of the time, making the area great, weather-wise, for weddings. However, it's not so great for candles. 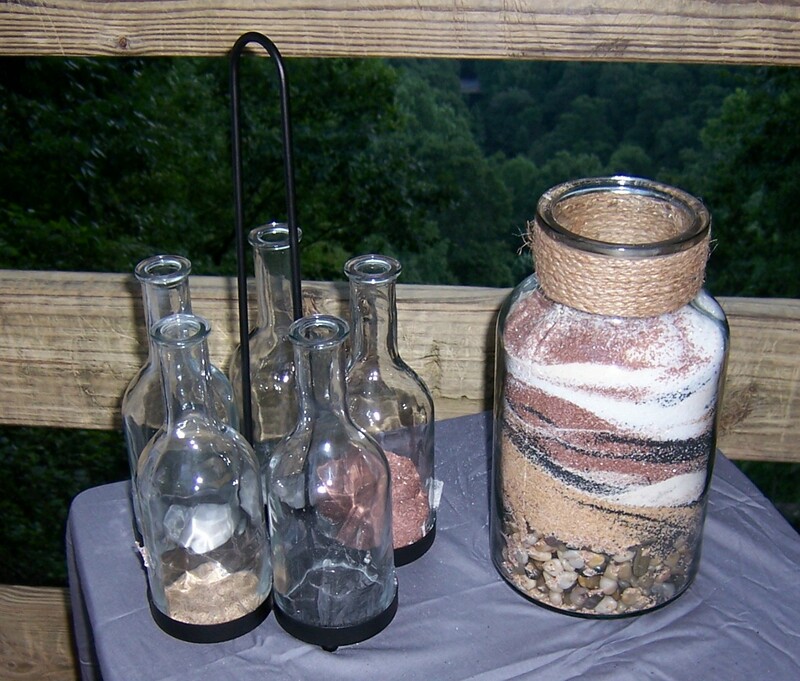 The idea is the same as the Unity Candle ceremony, but the couple uses containers of different colored sand instead. At the appointed time, each of them picks up their container of sand and pours them into an empty center one. The colors make unique patterns in the central container, which is then a keepsake for the bridal couple. Different colored sand can be purchased at any craft store. YOU MUST PROVIDE YOUR OWN SAND AND CONTAINERS. Some couples prefer to leave a little bit of sand in their own containers during the sand ceremony vows to show that, even though they are joined as one through marriage, they are still individuals. At one wedding I did, both bride and groom were born in March under the astrological sign of Aries, which is symbolized by two fish. Therefore they had fish ceremony vows instead of sand ceremony vows, in which each of them had containers holding a single goldfish, one white and one black. They each poured their fish into a central container to symbolize their togetherness. So there are many options that can be used for sand ceremony vows. If there are children involved in the marriage, such as a blended family, each child can have his or her own color and container of sand and join in the pouring of them into the big container. _______ and _______, you have just sealed your relationship by the giving and receiving of rings, and this covenant is a relationship pledge between two people who agree that they will commit themselves to one another throughout their lives. The most beautiful example of this partnership is the marriage relationship. You have committed here today to share the rest of your lives with each other. 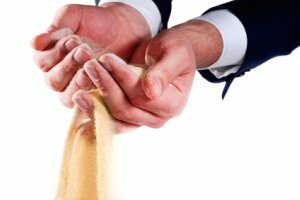 Today, this relationship is symbolized through the pouring of these two individual containers of sand, one representing you, ______, and all that you were, all that you are, and all that you will ever be. The other one represents _______, and all that you were, all that you are, and all that you will ever be. As these two containers of sand are poured into the third container, the individual containers of sand will no longer exist, but will be joined together as one. Just as these grains of sand can never be separated and poured again into the individual containers, so will your marriage be. Leave a small amount of sand in each container to symbolize that although you are now joined as one, you each remain individuals. ______ and ______, today you join your separate lives together. The two separate bottles of sand symbolize your separate lives, separate families and separate set of friends. They represent all that you are and all that you’ll ever be as an individual. They also represent your lives before today. As these two containers of sand are poured into the central container, the individual containers of sand will no longer exist, but will be joined together as one. Just as these grains of sand can never be separated and poured again into the individual containers, so will you marriage be. Leave a small amount of sand in each container to symbolize that though you are joined as one, you each yet remain individuals. You have chosen to seal your commitment to each other by the use of the sand ceremony. Each of you has an individual container of different colors of sand and an empty container in the middle. Please pick up your containers now and pour them into the middle one. As these grains of sand are mixed together, they represent the coming together of these two lives and loves. The sand cannot now be easily separated into the colors that they once were, just as this marriage cannot now be easily divided. They will remain mixed together as a symbol of your united relationship. Keep this central container as a memento of your wedding and of your love for each other. Here's an example of what one couple did at a wedding in August of 2013. It is best to use a wide mouthed center container so that it is easy to pour the sand into it. This one has a top with a candle in it which makes a nice combination for the keepsake. The candle part was removed during the pouring and then replaced back on top afterward. 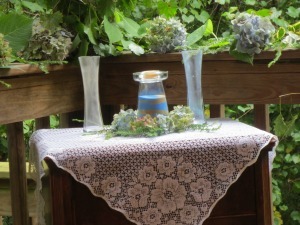 Another example of a great setup for a sand ceremony is this one from a wedding August 15, 2015. They had put pebbles and a larger stone in the bottom of the receiving container and all of the different colors of sand were in bottles that fit on this nifty metal holder. That made it easy to carry and set up. The top of the container has twine wrapped around it for a rustic look. The resulting pattern of the colors is stunning indeed! Go from "Sand Ceremony Vows" to "Home Page"
Go from "Sand Ceremony Vows" to "Wedding Vows"